Born in 1916 in Lahore, the son of Dr. Ghulam Jilani, a renowned Hakeem and the personal physician to the Shah of Iran, Masud graduated with a Bachelor’s degree from Government College Lahore. He joined Law College, Punjab University, where he stood first in the LLB examination in 1937, breaking all previous records of the Indian sub-continent. In 1941 he joined the Indian Civil Service and proceeded to St. John’s College, Oxford, for the further education and training. Upon his return to India, his first posting as a Government Officer was in Ahmadnagar, Bombay Presidency; from here he was sent to Khandesh, for the uplift of the downtrodden Bhil tribes. During his two years amongst the Bhils, M. Masud was able to free the tribes from the clutches of the Hindu moneylenders and successfully revived their language and culture. His untiring efforts and sacrifices beyond the call of duty for the Bhils, earned him the sacred title of “Masud Bhagwan”. 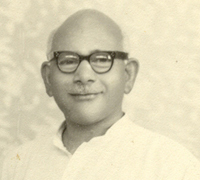 In 1946, M. Masud was transferred to Nawabshah (Sindh) as Deputy Commissioner. During the struggle for independence, he played a historical role in bringing Mohammad Ali Jinnah to Quetta and eventually persuading the tribal chiefs and the people of Baluchistan to join in with the creation of Pakistan. In 1947, at the time of partition, M. Masud opted for Pakistan and continued at the same post in Nawabshah. In March 1947, upon the insistence of Mohammad Ali Jinnah, a committee was formed to look into the suffering and inhuman conditions of the Sindhi Hari peasants. M. Masud was nominated as a member of this newly formed Hari Inquiry Committee. The controversial report produced by this committee in January 1948, prompted him to write his highly acclaimed “Note of Dissent to the Hari Report” which was presented to the Government in June 1949, but was never allowed to be made public. Soon afterwards, Masud launched his struggle for land for the landless and came to be known as “Masud Hari” throughout Sindh. In 1957, M. Masud made a place for himself in the history of Pakistan, as the only man ever, to have the courage of his conviction to lead the namaz (prayers) publicly in Urdu, at Lawrence Gardens, Lahore. It was his firm belief, that the only way to effectively communicate with God, was in ones own mother tongue. As a result of this death threats by religious leaders forced the Government to send him and his family abroad for sometime. In 1960, during General Ayub Khan’s tenure, Masud once again took on the Government. Putting his career at risk he wrote his strong and candid “Dissenting note on the Indus Basin Treaty” strongly condemning the sale of our rivers to India. In 1962 Masud started the first Punjabi monthly magazine “Haq Allah” from Karachi. Unfortunately due to financial constraints and a lack of Punjabi readership, ceased publication after two years. 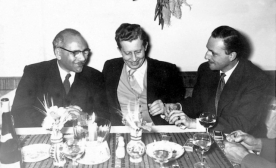 In 1965 M. Masud visited China on the invitation of the Government of Peoples Republic of China and was fortunate to have been given the opportunity to meet with Premier Chu En Lai, this 10 minute meeting continued for one hour. The purpose of his visit to China was to study the commune system in the rural sector and the industrial development in the urban areas. During his stay in China, M. Masud visited the entire east coast of the country from north to south. He was the founder member of “Group 83”, “Punjab Forum” and “Tehrik-e-Khushal Pakistan”. 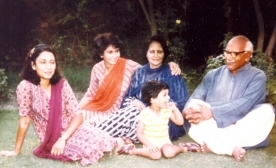 In 1992, the Human Rights Commission of Pakistan gave a posthumous award to M. Masud, for services towards humanity. Throughout his Civil Service career, Masud wore his national dress made from handloom khaddar cloth, as an encouragement and respect for the weavers of this dying skill and to be identified as an ordinary human being, regardless of his status as a Civil Servant. Masud today, is most well known as “Masud Khaddarposh” a name, which sets him apart from the rest. Masud was the greatest exponent of medium of instruction in the mother tongue and relentlessly persued this cause throughout his life. He started work on the formation of the Masud Khaddarposh Trust (MKT) but unfortunately, his sudden death in December 1985 did not allow him to see his work completed. Nonetheless, in accordance with his wishes, family members completed the formalities and MKT was established and its first awards ceremony was held in December 1986.